MILAN/LONDON (Reuters) - European stocks recovered on Tuesday, led by banking stocks while tech stayed under pressure after concerns over increased regulation and taxation of large companies in the sector prompted selling overnight on Wall Street. The pan-European STOXX 600 index ended 0.5 percent higher, while Britain's FTSE rose 0.3 percent after hitting a 15-month low in the previous session. Pressure on Facebook intensified as Britain said it was investigating after a whistleblower said a London-based political consultancy hired by U.S. President Donald Trump improperly accessed information on 50 million of the firm's users. Europe's tech stocks lagged the market, though they managed a 0.4 percent rise having lost more than 1.5 percent in the previous session. The sector remains the biggest gainer in Europe over the last 12 months. Strong financials meanwhile helped offset weakness among media and telecoms stocks. Support from Publicis evaporated as its shares turned lower following early gains of as much as 3 percent as analysts showed a mixed reception to its new business plan in a challenging advertising market. The world's third largest advertising group said it was redoubling efforts to become a consulting partner for global advertisers online to help boost sluggish growth. Liberum analyst Ian Whittaker affirmed his "Hold" rating on the stock, calling the plan ambitious. "On a general level, Publicis has taken probably the most 'bearish' view on the future of agencies, which probably reflects its acquisition of IT consultancy firm Sapient, and the wording of the statement reflects that," he said. Advertisers and media stocks are among the worst performers in Europe over the last 12 months, as they struggle to compete against big U.S. internet players like Facebook and Google which are facing growing regulatory scrutiny. Among tech manufacturers, shares in German software maker SAP fell 0.5 percent on a negative read-across from disappointing results at U.S. peer Oracle which reported sales from its cloud business fell short of Wall Street expectations. "(The) hiccup in Oracle's cloud business could hurt SAP sentiment," said a trader in Frankfurt. British software company Micro Focus fell another 1.9 percent, having lost 46.3 percent in the previous session after its CEO quit and it cut its revenue outlook. More than half a dozen analysts cut their price targets on Micro Focus. Telecoms stocks were the worst performers, weighed by Swisscom and Sunrise, which turned sharply lower after rival Salt Mobile said it would enter the Swiss fixed-line market. The two Swiss operators dropped 4.6 to 6.4 percent. UK mid-cap Fenner surged 25 percent after French tyre maker Michelin announced plans to buy the British engineering company for 1.2 billion pounds ($1.7 billion). Fenner shares closed at 612.5 pence, just above the 610 pence cash offer from Michelin, whose shares rose 1.2 percent. 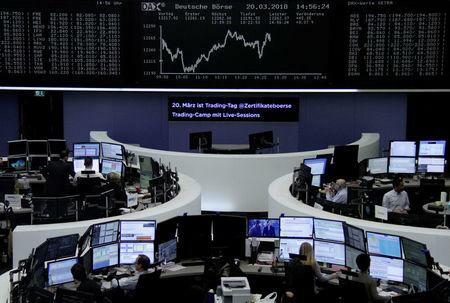 A sell rating from UBS sent shares in France's BIC down 6.8 percent to the bottom of the STOXX.